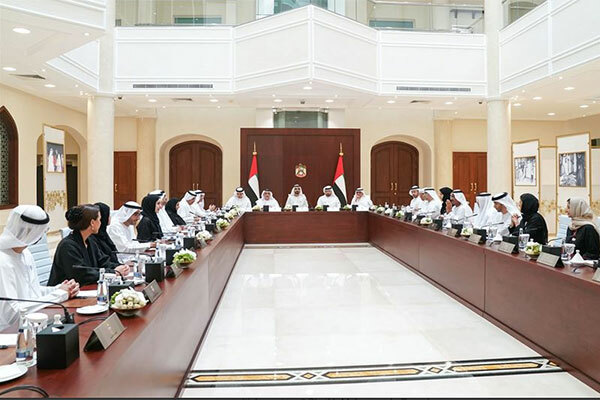 The UAE Cabinet has adopted a new package of national legislative policies, and initiatives to empower Emirati women in a special session held at the General Women's Union headquarters in Dubai. The session, chaired by Sheikh Mohammed bin Rashid Al Maktoum, Vice President, Prime Minister and Ruler of Dubai, the Cabinet approved the empowerment bundle in line with the directives of President Sheikh Khalifa bin Zayed Al Nahyan, to ensure that Emirati women are conducive partners in the UAE's development journey. During the Cabinet session, Sheikh Mohammed bin Rashid praised Sheikha Fatima bint Mubarak, chairwoman of the General Women's Union, president of the Supreme Council for Motherhood and Childhood, and supreme chairwoman of the Family Development Foundation. "Sheikha Fatima bin Mubarak is an inspiring and exemplary model for all women in the UAE. Her Highness is always invested in enhancing the role of women and ensure their active participation in building the nation,” he said. "Sheikh Fatima has carried on the legacy of the late Sheikh Zayed bin Sultan, who sought women's empowerment as a crucial element to the nation's development and now my Emirati sisters are reaping the benefits of Zayed's legacy." "We are now embarking on a new phase in which we provide more tools to enhance women's leadership roles and representation in society across all fields on the local, regional and global scale. The new initiatives will see women's increased participating in diplomatic missions, as well as an increased representation in judicial and legal affairs,” he added.